Everyone at UBC looks forward to our spring concert every year. 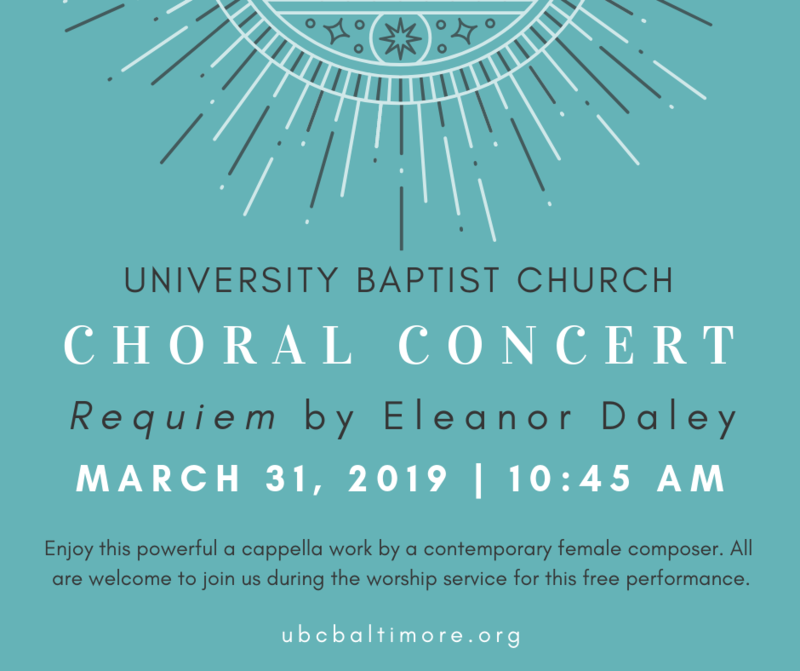 On Sunday, March 31st, we will have the opportunity to hear a contemporary work by Eleanor Daley. Be sure to invite your friends to the service so that they can enjoy some amazing choral music and a wonderful time of fellowship after the service. Are you excited about singing Christmas carols this year? Our Christmas Songs and Stories will be the perfect way to ring in the holiday season. You are invited to come to Fusion Worship in Davis Chapel at 9:00 a.m. and stay for Christmas Breakfast and the UBC Choir's presentation of Handel's Messiah. Please join us for Fusion Worship in Davis Chapel as we celebrate the Christmas season in a new and exciting way! Please join us to hear the UBC Choir and Soloists present excerpts from the Christmas portion of Handel’s Messiah, accompanied by strings and organ. Handel’s oratorio is one of the most familiar and popular of all choral works. We hope that you will be in attendance at the Sunday morning worship service on Sunday, December 17 [10:45 a.m.] and invite your entire family and friends to join us in celebrating the Christmas Season with Handel’s Messiah. Parking is available in the lot behind the church, and this event is free and open to all.